Meritocracy and a broken education system. When I’m around friends and colleagues, the talk inevitably turns to matters of merit: high-powered new jobs, prestigious fellowships, and publications in elite journals and university presses. Even among those pursuing the disinterested “life of the mind,” everything and everyone is ranked and sorted. As someone who’s spent many years studying education reform measures, I find this unsettling. The point was to change the world, not to weigh and measure it via reified standards that otherwise bear no relation to objective reality. But my friends can’t help themselves, and sometimes neither can I: we’ve risen in this pretend meritocracy thanks to our good grades and test scores, and we perpetuate its existence through our praise and criticism. It’s a truism among libertarians and conservatives that increased public education spending will not yield improved student outcomes. The principal metric for judging “success” in this regard is a school’s aggregate performance on various end-of-grade examinations. Criteria that are not as amenable to measurement, such as student comfort in better-furnished schools, are less worthy of consideration. I’ve always loathed this process, but followed it through to its logical conclusion. I sought the highest marks on all of my exams, and took some measure of pride in achieving them. When I worked for Kaplan, I taught test-taking strategies to the affluent and semi-affluent in order to improve their scores. 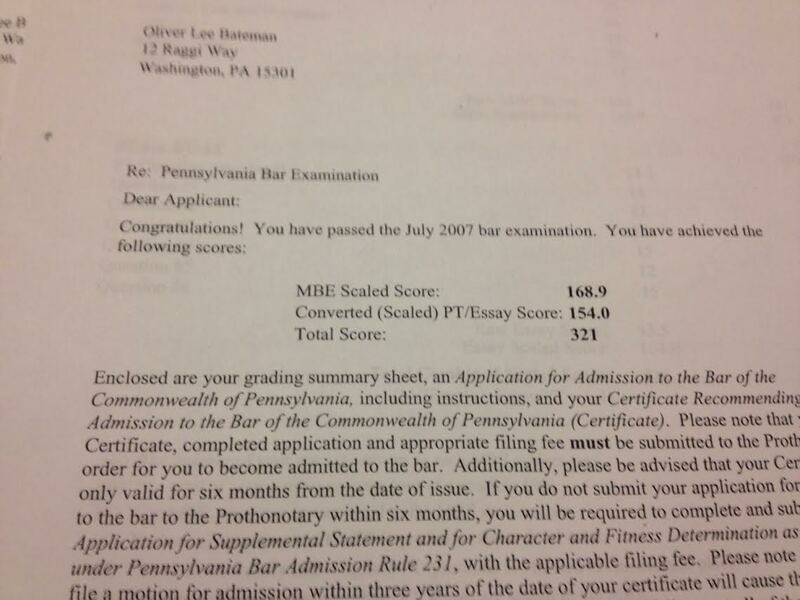 I earned extra money by tutoring law students preparing to take the Multistate Bar Examination. However—and much to my surprise—my dissertation advisor disdained the idea of punishing the students with oppressive grading standards and let me do as I pleased during my time as his teaching assistant. His attitude was refreshing: our roles as educators were compromised if we allowed ourselves to be dragged into lengthy debates about whether some student’s mediocre in-class essay deserved a C+ instead of a C-. After becoming a professor, I distanced myself further from this performance-driven model. I wrote and spoke openly about my willingness to give high grades to students already disadvantaged by the high costs and impersonal character of university education. My students would spend the rest of their lives being humiliated, scorned, and dehumanized by their superiors: why should I, tasked with developing their interest in a particular subject, contribute to this cycle of discouragement? Grades, it seemed to me, were less about saying “this student is prepared for the next step” and more about telling employers and graduate programs that “this student can be used with certain assurances that due diligence has been done in hiring or accepting him, as evidenced by his grades. I wanted no part of that. Soon after my article about grade inflation appeared in The Atlantic, I realized that the entire notion of academic and professional merit had to be jettisoned: simply giving A's to students wouldn’t do. The response to my essay was swift, as a multitude of well-meaning educators wrote to tell me that I was lowering standards, coarsening discourse, and otherwise contributing to the breakdown of Western Civilization as we knew it. These commenters, many of whom rose to whatever positions they occupied by stockpiling merit, remained unaware of their own personal stakes in this drama. Arguing against well-established conventions such as tipping and charity is akin to tilting at windmills; critics will quickly judge you to be cruel or deluded for asking them to take a second look at mechanisms that undergird capitalist society. But the existence of academic merit, which perpetuates an inegalitarian hierarchy in the midst of the “level playing field” to which so many express fealty, is pernicious—particularly since it’s defended by almost everyone who has experienced some measure of success through acceptance of the status quo. In other words, merit may be among the most difficult privileges to check: If Distinguished Professor X earned his bones by writing award-winning books and securing thousands in grant money, surely anyone can; you’re just not trying hard enough, young fellow! Students entering public school find themselves at the beginning of a long process during which their value will remain forever in question. At each stage, bad marks or an insufficient list of honors could lead to them being discarded, capitalist debris left behind as the storm we call progress blows their high-achieving peers into an ever more competitive future. The solution, as I see it, is not to transform everyone into a Rhodes Scholar or Phi Beta Kappa; rather, it’s to abandon the fixed idea of a meritocracy to which these eager beaver high achievers have devoted their lives. Instead of ranking one another by various orders of accomplishment, we must stop testing and grading so that we can advance together as learners invested in a common enterprise.